A milestone is fast approaching for Full Tilt Ice Cream, as it celebrates its 10th anniversary on June 20th, 2018. On June 19th, they will be celebrating the newest store with a day of free ice cream at the Capitol Hill location. 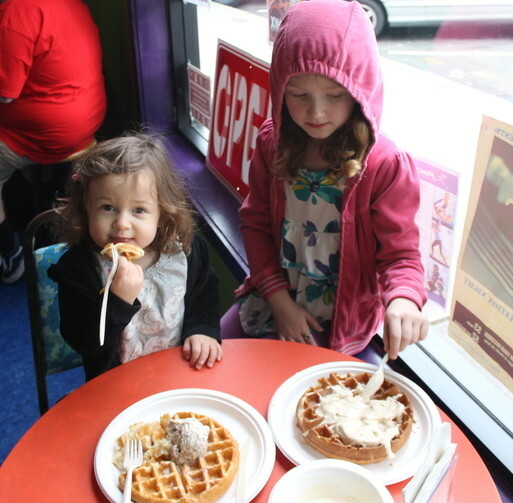 From noon on, the first 200 people will receive a free kids scoop. We have had a lot of amazing memories from the past 10 years. We have hosted some great bands, some had their first show at Full Tilt. Other nights we hosted bands and artists that we are grateful that they decided to actually play. Mudhoney, Spencer Moody, Damien Jurado, and Kimya Dawson come to mind. There have been countless birthdays and celebrations hosted inside our walls, and we are overjoyed every day to see the faces of our community members that have supported us for an entire decade. Our first day we had no idea who would show up. We figured our friends would come see us, and maybe a few people in the neighborhood. We sold out of everything in a few hours, and the next day was even busier. White Center has changed so much in the past 10 years. Some of it good, and some of it a little sad, but we are happy to be a member of the community. 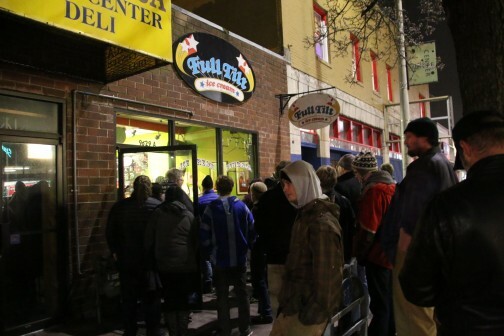 Full Tilt Ice Cream, established in June 20th, 2008, in Rat City, was founded by Ann Magyar and Justin Cline and originally had one location, no employees, and no idea what they were doing. Now, with over 30 employees and 5 locations, over 200 wholesale clients and plans for massive future expansions, it seems the next 10 years will be even more fun. From books to scoops! Seattle’s legendary librarian Nancy Pearl is scooping a special flavor at Full Tilt Ice Cream until at least 3:30 pm, as the first chapter in Full Tilt’s series of special one-week-only scoop-shop flavors honoring local icons, to “pay homage to the people, places and events that have made Seattle the amazing place that it is.” Hers is peanut butter with a fudge swirl, and she’s opening the series in part because it’s National Library Week! We were there around 2:30 and the shop was wall-to-wall with fans. 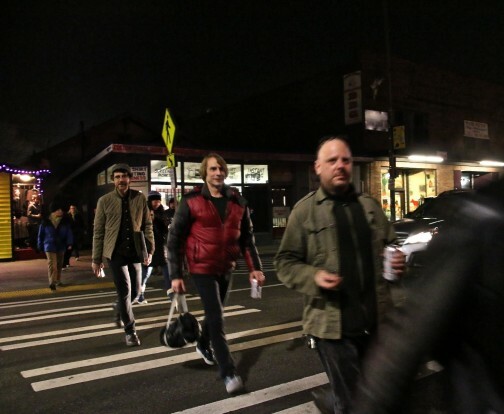 FT says future icons will include “Mudhoney, the Space Needle, Richard Hugo, Sub Pop, Frances Farmer, Easy Street Records, and August Wilson.” Stay tuned for dates, and flavors! Full Tilt Ice Cream is launching the Seattle Icon series this spring and summer. This series will pay homage to the people, places, and events that have made Seattle the amazing place that it is. The series will run from April to September, and span both living and existing icons as well as Icons from Seattle’s rich past. The flavors will be available in the 4 Full Tilt scoop shops for one week only. The first Icon in the Series is going to be Nancy Pearl, Seattle’s librarian. This will coincide with National Library Week. A portion of the proceeds will be going to the White Center Library Guild to help with the new library being built. Nancy has requested a peanut butter ice cream with a fudge swirl. She will also be a guest scooper at Full Tilt’s White Center location April 16th, at 2 pm. 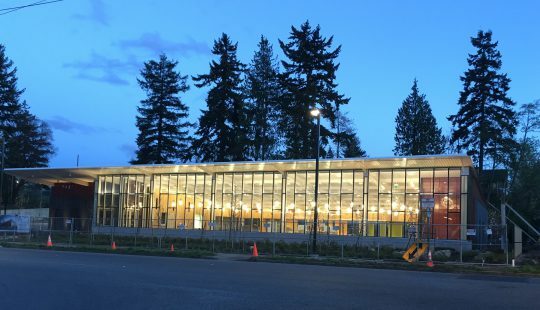 The White Center library is also going to unveil pictures of the yet unfinished library. Future Icons in the series will include Mudhoney, the Space Needle, Richard Hugo, Sub Pop, Frances Farmer, Easy Street Records, August Wilson, and many others. Full Tilt Ice Cream is a family-owned ice cream shop that started in White Center, Washington in 2008. 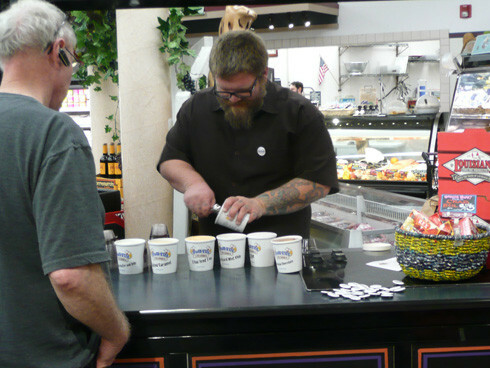 All of Full Tilt’s ice cream is produced using local cows, and as many local ingredients as possible. Now with over 30 flavors in pints available at grocery stores all over the Pacific Northwest, and hundreds of flavor possibilities at the local scoop shops as well as restaurants and hotels around town. The first special flavor will be available starting April 11th, FT tells WCN. 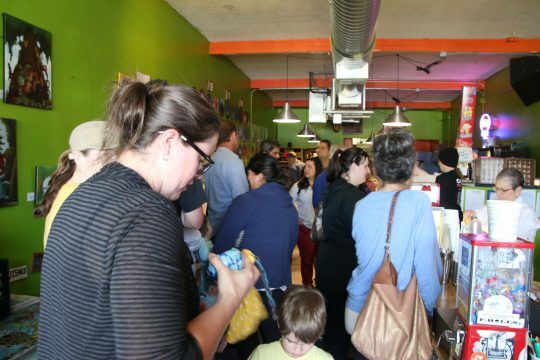 Happy 7th anniversary, Full Tilt Ice Cream! 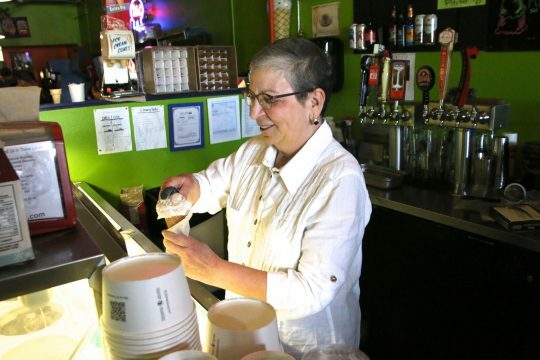 June 19th, 2015 Tracy Posted in Full Tilt Ice Cream, White Center news Comments Off on Happy 7th anniversary, Full Tilt Ice Cream! The wonderful and fantastic Kimya Dawson! And the lovely Apis Malifera! Live music, ice cream, beer and pinball! 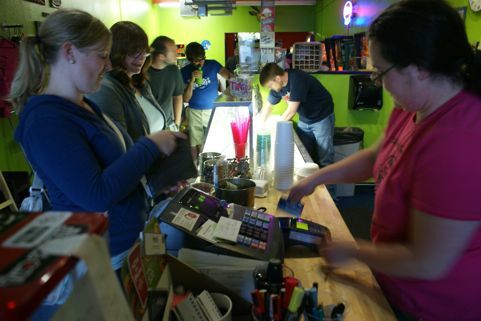 If you’re new in town … FT is at 9629 16th SW.
June 20th, 2014 Tracy Posted in Full Tilt Ice Cream, Fun, White Center news Comments Off on Happy 6th anniversary, Full Tilt Ice Cream! 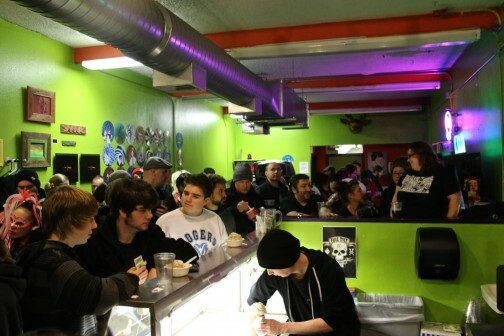 Full Tilt Ice Cream is six years old today – and White Center is still home, though they’ve opened other locations, partnered in other ventures, and distributed their popular ice cream in many a store. So there’s a party tonight, and you’re invited to stop by, including music from Rats in The Grass around 6 pm. See you there! 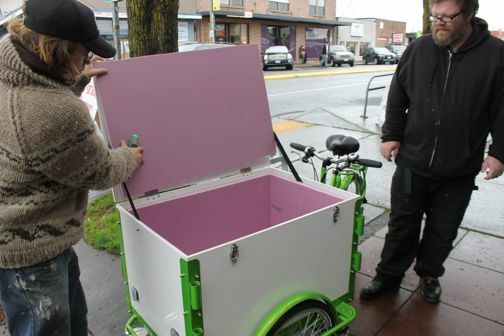 Asked for the latest Full Tilt news, Justin mentioned their soon-to-launch truck, which he says will spend a lot of time at Alki Beach this summer, and a deal that will double the number of grocery stores carrying Full Tilt pints. Right now, they’re in about 60 stores, and they’ve been picked up for more than 60 QFC stores in Western Washington. Nothing says “summer” and “ice cream” like three people in jackets standing on a sidewalk in the chilly rain. Wait! 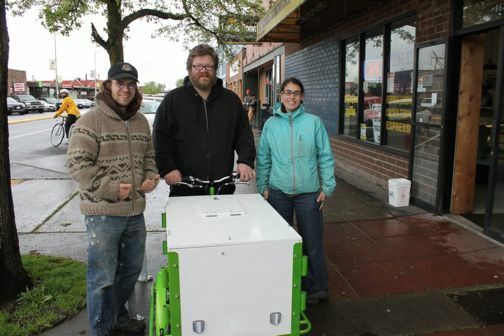 Turn your attention to what’s in the photo with Full Tilt Ice Cream proprietor Justin Cline and the folks from Portland’s Icicle Tricycles … a brand-new ice-cream bike! The tricycle that arrived on Saturday (we know, not the same kind you remember from preschool days) joins the one Full Tilt has had running for a few summers now. New future for a White Center space with a rocky past: Meet the future home of Full Tilt Laboratories! White Center is where Justin Cline and Ann Magyar launched Full Tilt Ice Cream, and it’s where they’re adding an additional business space to facilitate more growth. We were there late this morning when Justin got the keys (from broker Mary K. Wynn, left) to the 16th SW space on the south block of downtown White Center that was briefly known as GAME Lounge, before that the Hang Around and The Wall, among other identities – like a fancy restaurant called Epicure. P.S. WC Food Bank is one of many local nonprofits that you can support with an online $ donation today through the Seattle Foundation’s one-day GiveBIG drive. Find them (and other eligible White Center orgs, including WCCDA) on this list – and follow the links there to donate today and make them eligible for “stretch” dollars – gotta do it by midnight! 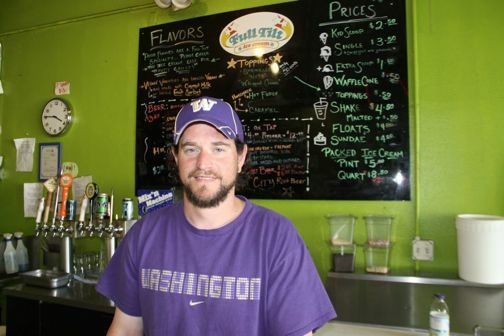 In case you missed the story on our partner site West Seattle Blog late last night – today, Full Tilt Ice Cream is celebrating its third anniversary. (WCN didn’t launch till later that summer, so our first report about FT was on WSB, and it seemed fitting to publish the anniversary story there.) Right now, they’re open Mondays for the first time – and they’re going to donate the equivalent of today’s ice-cream purchases to the White Center Food Bank. You’ve got till 10 pm to go be part of the tasty fun. 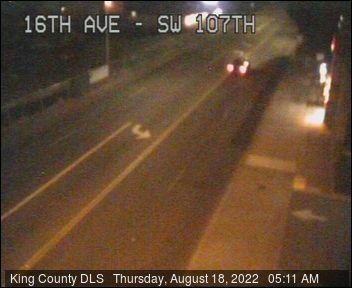 Two big events tonight in White Center: The North Highline Unincorporated Area Council meets at 7 pm at the North Highline Fire District HQ – here’s the agenda, as mentioned here on WCN earlier in the week – and an ice-cream social at Full Tilt Ice Cream, complete with live music! Details and RSVP info here. As previewed last weekend – noon-2 pm today, quite the party at Full Tilt, with live music, a new ice-cream favor, and general revelry. P.S. 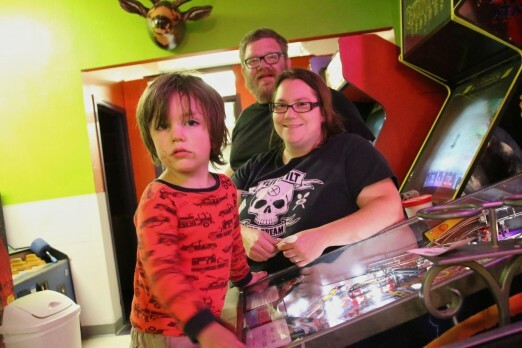 If you haven’t voted yet for Full Tilt and some other White Center faves like Proletariat Pizza in the Best of Western Washington online polls, just a couple days left – it starts here. Tomorrow (Sunday), Full Tilt Ice Cream celebrates its second anniversary in White Center, and they’ll donate to the White Center Food Bank the equivalent of the scoops/pints you buy tomorrow – so it’s their birthday, but they’re giving instead of getting.